Halloween is the one time of the year I truly let my inner Goth out. I love buying clothes during October that are more aimed for 'Halloween' but I'll wear all year round, so why oh why are the plus sized options so utterly meh!? I'm sorry fashion shops but a bit of black velvet or a bloody bat wing doesn't count as Halloween sleek and just because something is black definitely doesn't mean it should be merely for Halloween! I'd say around 90% of my wardrobe is black, I was a uber Goth when I was younger and dark clothing is something that has stuck with me through out the years. I love band shirts, black dresses, black jeans and leather jackets so why is it suddenly Halloween fashion? 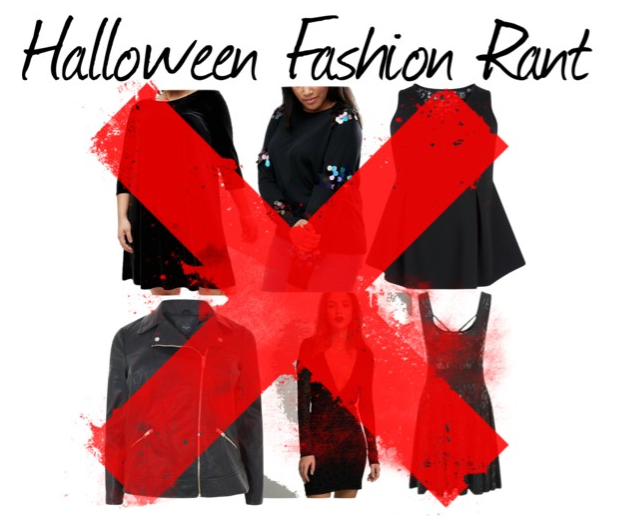 There's loads of ways to go to a Halloween party without dressing up in a full blown costume but it certainly doesn't mean you have to wear something black! I just don't understand why pushing everyday clothes as Halloween clothes has become a thing. Take Asos Curve for instance, they have an utterly gorgeous black jumper with clusters of large sequins on, under the Halloween section. Why?! If you don't have enough Halloween related clothes surely that says something about the products you stock and potentially a gap in the market? Thankfully I don't seem to be the only plus sized blogger a bit annoyed by this years offerings and I've had loads of people talk to me on Twitter about how outlets are listing things they wear everyday! What do you think of this years plus sized Halloween fashion?